The Pacific War Online Encyclopedia: Draemel, Milo F.
Milo Draemel had served on the faculty of the Navy War College and was Commander, Destroyers, Battle Force, Pacific Fleet at the time of Pearl Harbor. At the moment of the attack, he was on his flagship, Detroit, in the harbor. He had a hunch the Japanese "might start something in the area that day" (Prange 1983) and declined to go ashore. 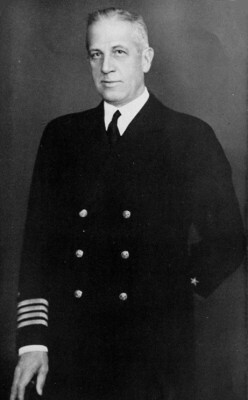 Draemel served as chief of staff to interim Pacific Fleet commander Pye during the abortive Wake relief expedition. A thoughtful strategist and planner in the mold of Pye, he later expressed the opinion that he was chosen specifically to check the impetuous "Soc" McMorris. He recommended against strikes against the Mandates in January 1942, an attitude Halsey condemned as defeatest. Though Draemel had served Nimitz well in the first weeks of his command, with time he seemed increasingly spent and out of step with Nimitz's aggressive outlook. Following the battle of Midway, he was replaced by Spruance and spent most of the war as the commandant of 4 Naval District in Philadelphia.